Producers have known for years that one of the best ways to achieve a noticeable improvement in livestock nutrition and health is to use supplements. Seasonal variations in pasture quality mean that using supplements for livestock increases the profitability and performance of farms. Our sales team speaks to a wide variety of producers in Australia, who are all using different combinations of supplementation methods. One of the most common questions we hear from people new to BLM products is, ‘what’s the difference between my traditional supplementation plan and your liquid supplements?’. It’s a good question! Making the right choice can save you time, be more cost effective and help you achieve better results. If you’re considering making the switch to liquid supplements to improve your livestock’s nutrition, here’s the information you need to know. 1. Liquid supplements work on both dry and green feed. Most traditional supplementation methods aren’t effective on green feed. While green pasture is plentiful and lush, livestock are able to make use of the nutrients present. However, when feed is in early growth, nutrition levels are low and deteriorate, leaving the period between dry and green feed where livestock may not be consuming their maintenance nutrient requirements. Liquid supplements can be used throughout all seasons, helping your livestock take better advantage of the green feed when it’s available, providing missing nutrients throughout the critical periods and continuing to keep livestock nutrition levels high throughout the dry season. 2. Liquid supplements have no added cost to add an attractant. Supplementation methods such as blocks and licks are usually not enough to tempt your livestock, and you’ll need to add salt or molasses to get them to consume the added nutrients. This is often an added cost on top of the supplement itself. Liquid supplements are mixed in with your livestock’s water supply in the trough, so the dose is already present somewhere that the animals will go to drink. BLM supplements also include aniseed oil as an attractant. There’s no need to purchase other attractants on top of the supplement. However, you should be aware that overdosing the water may make it too strong and deter the animals so it’s important to check the dose rate before adding any liquid supplements to your livestock’s nutrition plan. 3. Liquid supplements have easier application methods. If you use injections to supplement your livestock, you’ll know that you need to get them into the yards in order to complete the process. Yarding is often a stressful time for animals and it can take up a lot of your time. If you use blocks or licks, you’ll know the amount of time it can take out of your week driving around your property to make sure your herd have easy access to the supplements. As liquid supplements are provided in the water supply, your livestock can stay happily in the paddocks with their young, saving them stress. All you need to do is apply the right dose to the troughs using the BLM dispenser. 4. Liquid supplements don’t need to be consumed every day. Traditional methods of supplementation generally require your livestock to receive a daily dose of the supplement to be effective. You need to make sure the blocks or licks are available all the time to ensure they’re meeting the maintenance nutrition requirements. Our liquid supplements only need to be dosed once every six weeks. If you are using the dispenser, it will take three to four days to dispense out. Those animals are then treated for six weeks. One of the electrolytes present in BLM supplements is fulvic acid, which allows livestock to retain the nutrients in available levels for six weeks. 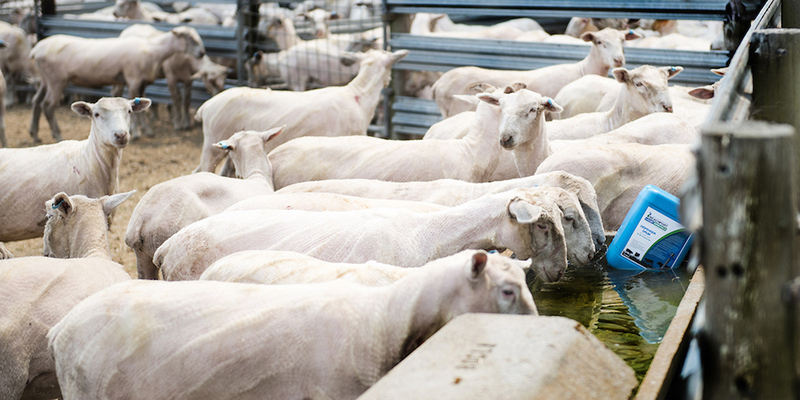 Liquid supplements for livestock are a great opportunity for producers looking to save time, increase the profitability of their business and improve the health of their herd or flock. They can even be used in conjunction with existing supplementation plans where deficiencies are extreme to boost their efficiency and cost-effectiveness. If you still have questions about introducing liquid supplements to your existing supplementation plan, please read over some of our frequently asked questions or get in contact with our sales team! Alternatively, watch our video showcasing what some of our clients are achieving with liquid supplements.